The once well-respected Guardian has been reduced in recent years into a lame Zionist mouthpiece - a light Jewish Chronicle for Gentiles consumption. 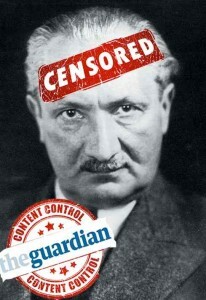 Last week, the paper launched an attack on Martin Heidegger, the 20th century’s most influential philosopher. “Heidegger's 'black notebooks' reveal antisemitism at core of his philosophy” the paper’s headline read. But what does that mean? Was Heidegger really a Jew hater? Did he oppose people for being ethnically or ‘racially’ Jewish or was he, instead, critical of Jewish politics, culture, ideology and spirit? According to the ‘progressive’ British Guardian, the newly published Black Notebooks reveals that Heidegger saw 'world Judaism' as the driver of “dehumanising modernity”. Needless to mention that we didn’t need a ‘new publication’ to assert that this was Heidegger’s view of Jewish culture and politics. The German thinker, like many of his contemporaries, saw “Jerusalem” as a suppressive and corrupted spiritual, cultural and intellectual influence as opposed to “Athens”, which portrayed in his eyes, the birth of humanism, universalism, aesthetics, ethics and pluralism. But aren’t we entitled to criticize religion, culture or Ideology? Aren’t we allowed to disapprove of modernity or technology and to try to identify its cultural and ideological roots? For some reason, I can’t recall The Guardian taking Max Weber to task for suggesting that Protestant ethics was the driving force behind Capitalism. Embarrassingly enough, the same Guardian that clumsily and shamelessly smears the greatest continental thinker, provides a platform to a long list of Neocons, pro-war advocates such as Nick Cohen who constantly and relentlessly criticize the so-called ‘Islamo-Fascists’ - a code name for Islamic political culture. I guess that for The Guardian of Judea, it is only Jewish culture, religion and ideology that must remain beyond criticism. "World Judaism", Heidegger writes in the notebooks, "is ungraspable everywhere and doesn't need to get involved in military action while continuing to unfurl its influence, whereas we are left to sacrifice the best blood of the best of our people". But is the above observation anti Semitic? Can an honest observation be anti Semitic, or shall we say a form of ‘hatred’, or should it be more appropriately tagged as an uncomfortable truth? When Heidegger published his monumental Being And Time (1927), certainly the 20th century’s most important philosophical text, the Frankfurt School, dominated by Jewish academics, had already been in operation for more than four years, gaining ground in its attempt to subvert German culture in the name of communism. As a German nationalist, Heidegger had more than just one reason to oppose Jewish culture, politics and ideology. Heidegger was a philosopher as opposed to a politician or an ‘activist’. His understanding of the world was driven by the search for an essential and categorical comprehension. For Heidegger it wasn’t the ‘Jew’ nor was it ethnicity that posed danger, it was an ideology and culture that was set to undermine his Athenian West and its value system as he saw it. Such an approach has nothing to do with racial hatred. Let’s examine Heidegger’s above statement regarding ‘world Judaism’, its ‘ungraspable’ impact and its unwillingness to ‘sacrifice.’ Heidegger basically suggests that the Jewish elite is launching wars by proxy. At first, this may sound like a vile criticism of Jewish culture and power within politics. But a deeper look into this statement reveals that Heidegger was highly observant. Let’s face it, Heidegger certainly didn’t know about the cabal of Zionist neocons who pushed Britain and the USA into an illegal war in Iraq five decades after his death. Heidegger, most definitely didn’t know about the Jewish Lobby Groups: AIPAC, LFI, CFI and the CRIF. He certainly didn’t know of Bernard Henri Levy or Jewish Chronicle writers David Aaronovitch and Nick Cohen, who have been advocating Zionist immoral interventionist campaigns for years. Furthermore, as Heidegger predicted, not many young Jews followed the Zionised Neocon militant enthusiasm and rushed to join the US Army Special Forces or The Royal Marines. Heidegger somehow foresaw that Jews wouldn’t be overrepresented in the list of dead British and American soldiers that emerged out of this chain of futile conflicts. When Heidegger writes, “we (the Germans) are left to sacrifice the best blood of the best of our people,” it is Zionist proxy wars he has in his mind - those Zionist wars that are fought by everyone except the Zionists themselves. But how could the philosopher predict the Zionist’s political apparatus so precisely? Was he a prophet? To philosophize is to dig into the true essence. The philosopher’s quest is a search for the essential meaning, whether it is being, beauty, knowledge, science and so on. Heidegger, the philosopher, saw in Jewish culture something most Jews either fail to see in themselves or conceal very well and for a good reason. It is hardly surprising that The Guardian that has systematically failed to confront the Jewish Lobby and its relentless war advocacy, would denounce the great mind who accurately listed the exact conditions in which such bellicosity takes place. Tragically, annihilating intelligencia and deep critical thought has become an obsession of the New Left. This may explain the deterioration of the progressive discourse into an intellectual desert. The Guardian, in its current form and under its current leadership, has a major role in that process. “In another passage”, the Guardian continues, “the philosopher writes that the Jewish people, with their ‘talent for calculation’, were so vehemently opposed to the Nazi's racial theories because ‘they themselves have lived according to the race principle for longest’”. But is this really a lie? Not at all. The German philosopher obviously hits the nail on the head. Heidegger, who didn’t approve of the Nazi racist doctrine, properly noted that Nazi racial supremacy was, in fact, Kosher by nature. It is hardly a secret that Jewish culture is ethno-centric and racially driven. Israel defines itself as the ‘Jewish State’. Far more embarrassing is the fact that Israel’s Jewish opponents also follow the same racially supremacist methodology and, in most cases, operate within ‘Jews only’ political cells (such as JVP, IJAN, Jewish Socialist Group etc.). Heidegger, was obviously ahead of his time in observing the similarity between Jewish political exclusiveness and Nazi ideology. Does that make Heidegger an anti Semite? Quite the opposite, it affirms that the German philosopher is a timeless precious intellectual asset. Yet, The Guardian doesn’t posses the minimal integrity to admit that Heidegger was actually spot on. Instead, the British paper is desperate to undermine the work of the great philosopher by means of inept and vague association. By tagging Heidegger as an anti Semite The Guardian basically advises his readers not to read the greatest Germano-Greco philosopher and certainly not to evaluate the content of his writing. This is ‘Newspeak’ as observed by Orwell, which minimizes the possible content of intellectual exchange by means of ‘correctness’. It is no secret that the contemporary politically correct observer adheres to the rule that truth better be inoffensive. As such, he or she contributes to the suppression of the truth and the transformation of knowledge into a system of selective concealment. Interestingly, it was Heidegger who was there to turn the floodlight onto ‘concealment’ and the ‘forgetfulness of Being’, something the Guardian has made into an art from. Heidegger, the truth teller has come to represent everything the Jerusalemite ‘Guardian of Judea’ is there to suppress. I guess that the time is ripe for The Guardian to wake up. It would do well to reinstate its position as The Guardian of the truth rather than The Guardian of Zion. We could use a quality Left paper driven by true humanist and universal concerns, instead of just another ignorant and banal Zionist mouthpiece.